The famous M Shack! I have heard so much about this place that I just had to try it out for myself. 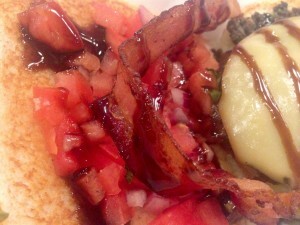 This review is for their new location out at the St. Johns Town Center. The original location is out at the beach. I’ll give you a hint….this makes my “Eat Here” category. Food: Everyone raves about Sunrise Burger, but I just haven’t signed off on the whole Sunny Side Egg thing on my burgers. I don’t like runny eggs, period. There is just something about eating a liquified chicken baby that I can’t get over mentally. Yes, I will eat the grown up fried, de-boned, destroyed version of a chicken…heck I love scrambled eggs…So, sorry, can’t do the runny egg thing. 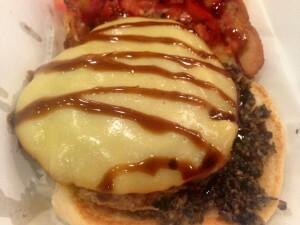 I decided to go with the Portobello Truffle Burger for $6.95 (Menu Description: Our signature beef patty with smoked gouda cheese, bacon, truffle flavored Portobello mushroom and a sherry glaze). I mean, everything in that burger is perfect! How could I not order that?!?! When the burger came out I was surprised about the mushrooms. That was the first thing I saw. They were minced up real small. Not a big deal, it’s just that my preference is bigger sized mushrooms for the texture with each bite. EVERYTHING else was spot on and delicious! The burger was perfectly cooked. When I bit into it, just a tad of juice was running out of it…just the way I like it. The sherry glaze was a nice touch to go with the gouda cheese. The burger was all kinds of awesome. One of the best I have ever had. For my side, I ordered the Truffle Parmesan Fries for $4.95 (I wanted to keep with the truffle theme). I really wanted to try the Poutine but I was by myself and didn’t think I could handle all of that by myself. Next time I will take someone to help me try them out. The fries weren’t anything special. They weren’t bad, they just weren’t OMG! I HAVE TO EAT THESE EVERY TIME! So I think I will have to try a different type next time. I also had a side of ranch dressing that is “house made” it was super thin but tasty. I prefer my ranch a little thicker (#TWSS) but this was decent. For the best ranch in Jacksonville, check out my review of: Bay Street Cafe. 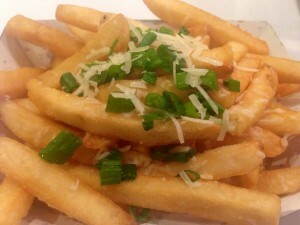 For some good fries while at the Town Center, check out my review of French Fry Heaven. 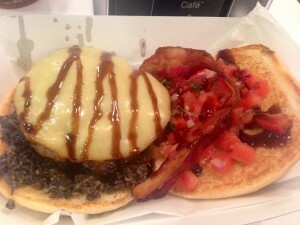 Extras: Once they create a location in Urbanspoon for the location at the Town Center, I will move this review there. A couple of things about this location…There is a ton of parking in this area. If you haven’t been to the Town Center in a while, it’s where the Ritz Camera store used to be. 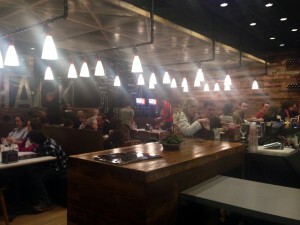 When you walk in, there is a full bar to your right and the line to order your food is straight ahead. You place your order and then seat yourself. They give you a number to place on your table and they bring your food out to you when it’s ready. And, one last extra, try their milkshakes, everyone is crazy about them. I haven’t tried one yet, but you can bet I will next time! Overall, this place is one of your best options for a burger in all of Jax. – I got nothing for ya. Check out these best baby food makers.